Discount JUGS BP2 Baseball Pitching Machine • Free Shipping! If a major league pitcher can throw it, the JUGS BP2 Pitching Machine can throw it! With speeds ranging from 45 to 90 MPH, the JUGS BP2 pitching machine can throw fastballs, curveballs, sliders, screwballs and even knuckleballs. Even better, patented micro adjustment wheels on the machine allow you to make slight up/down and left/right adjustments to better spot pitches in the strike zone. 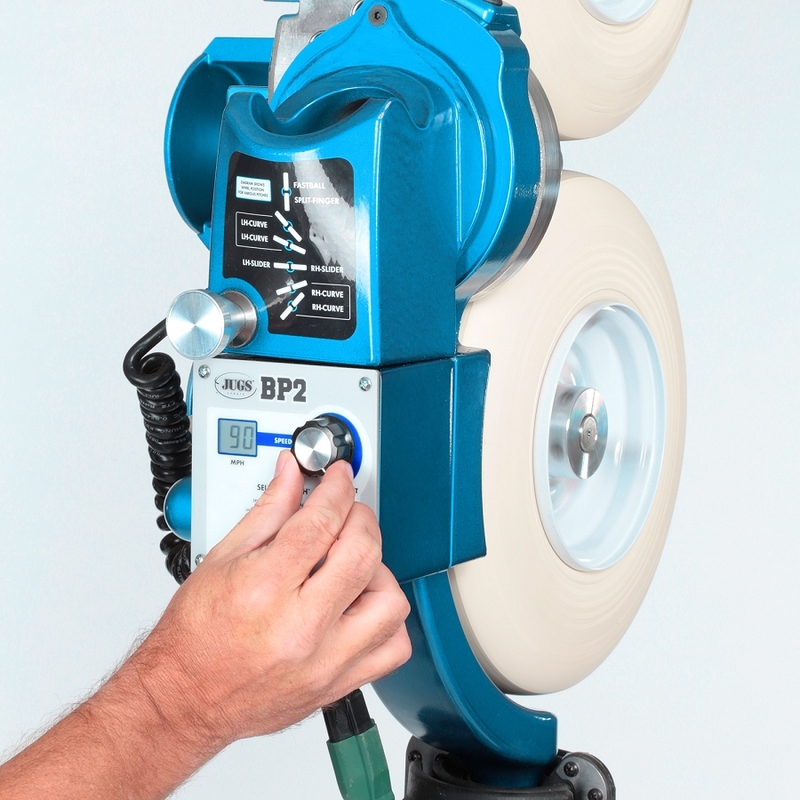 And, unlike the other JUGS machines, the BP2 pitching machine has preset positions for each type of pitch, making it much easier to switch from fastball to curve, curveball to slider. It also throws from a more realistic 64" pitch height. 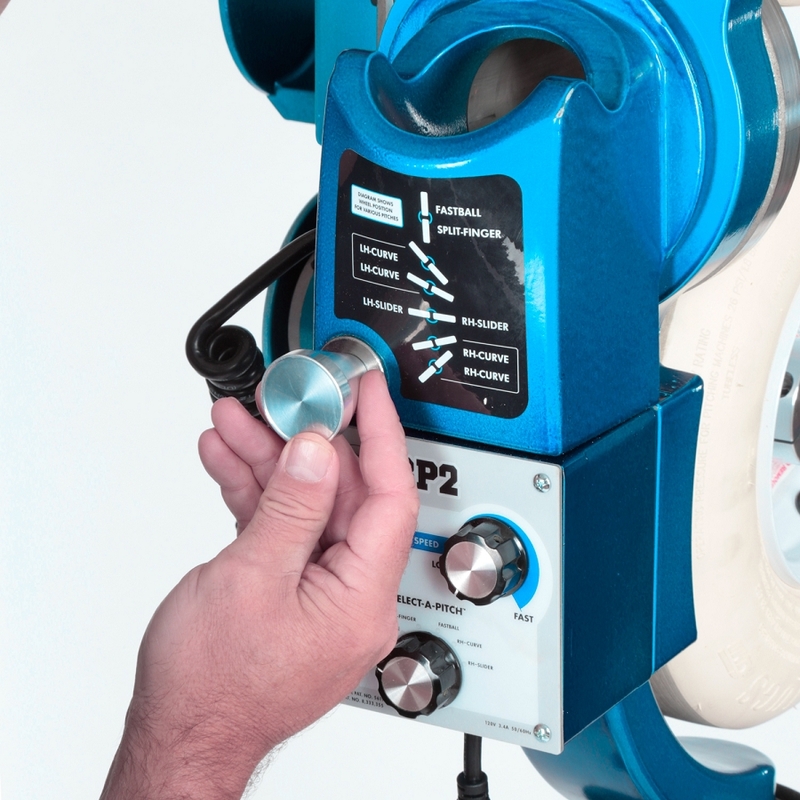 Speed adjustments are very easy to make with the JUGS BP2 machine. Their "Select A Pitch" dial allows you to pick the type of pitch and the speed knob sets the speed of the pitch. Then, it's simply a matter of adjusting the angle of the wheels - no more looking at a chart to see what speed each wheel needs to be for a certain type of pitch. 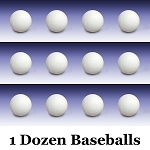 The JUGS BP2 pitching machine can throw real baseballs, dimple balls, lite balls or even tennis balls. Not just for hitting, the JUGS Curveball pitching machine is fantastic for fielding practice, too. It can rotate 360 degrees, allowing you to cover the entire field. Put backspin on fly balls or topspin on grounders to create a more realistic fielding experience. Don't forget the catcher; fielding and blocking pitches in the dirt with various different spins will take any catcher's game to a whole new level. One of the truly great things about the JUGS BP2 Pitching Machine is that it is very portable. Although it weighs 125 pounds, the wheels can be used to roll the machine across the ground, utilizing the legs as handles. If you're serious about your game, this is the pitching machine for you. JUGS pitching machines are used by more high schools, colleges and pro baseball teams than any other. It comes with an outstanding 5 year manufacturer's warranty, too! It is powered by any standard 110 volt electrical outlet. For complete warranty information, please see our Shipping and Returns page. Throws every kind of pitch imaginable - fastballs, curves, sliders, screwballs, sinkers, knuckleballs, etc. Q: I have a 45' cage. Can I use the Jugs curveball machine at this distance? A: You can definitely use any pitching machine in a 45 foot cage. You'll probably never get the machine up to it's top speed, however, because the ball will get to the batter faster from that distance. Also keep in mind that a breaking ball will not break as much in 40 feet as it will traveling 60 feet. 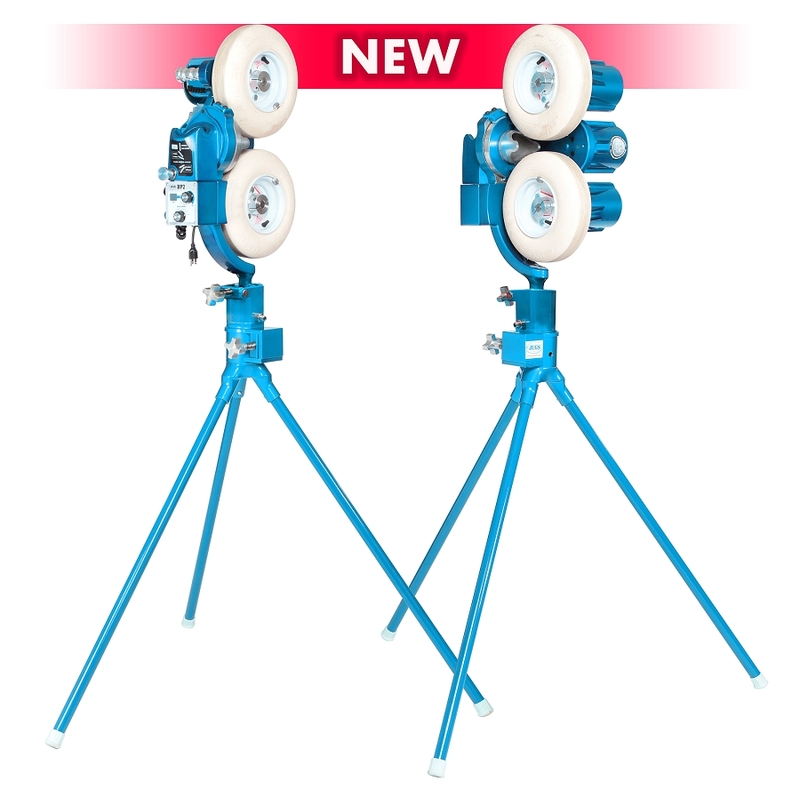 The JUGS BP2 Pitching Machine can throw virtually any type of baseball - real, dimpled or lite balls. 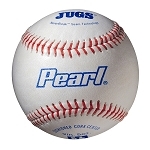 JUGS Sports guarantees that JUGS BP2 Pitching Machines are well made; of good materials, and workmanship; and agrees that if, within five years after shipment thereof, any part so guaranteed should fail because of defective material or workmanship in its manufacture, the Company will repair or replace such part, free of charge F.O.B. to its factory in Tualatin, Oregon; provided, however, that upon request, the Buyer shall return the allegedly defective part to the Company s factory with transportation charges thereon prepaid. No matter where you order a JUGS BP2 Pitching Machine from, NOBODY actually stocks them; they all ship directly from the manufacturer's warehouse located in Tualatin, Oregon. Therefore, the shipping time frame is exactly the same no matter what website you order from (we hope that it is this one!). 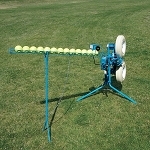 JUGS BP2 Pitching Machines typically take 2-4 business days to ship from the time you place your order. They ship via Federal Express (FedEx) Ground and could take anywhere from a day or two to a week to get to you AFTER being shipped, depending on your proximity to their warehouse. We will notify you of your tracking number the moment we receive it from the manufacturer's warehouse. Click here to download an easy to read, printable PDF of the JUGS BP2 Pitching Machine Owner's Manual.